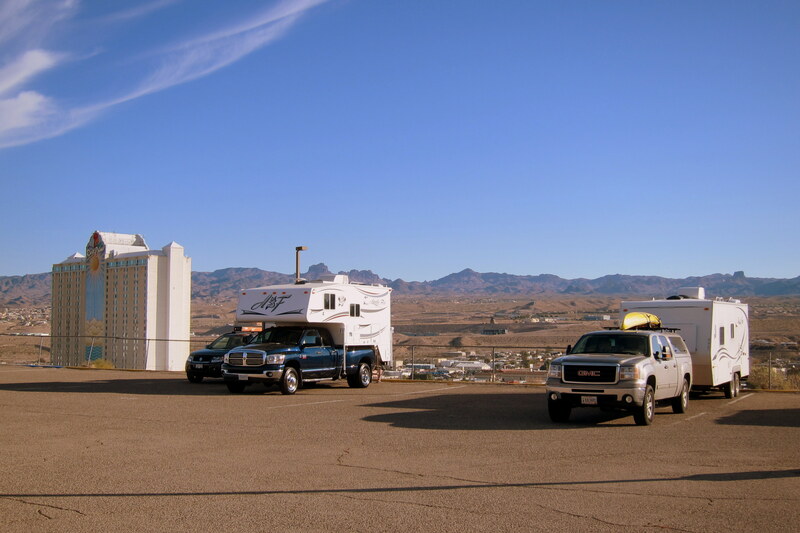 Thursday, December 19, 2013: Woke to very windy conditions (outside the camper) and temperatures hovering in the low 50’s. How windy you ask? Well just ask our poor neighbors. The two lumps are a young couple from California. They were fine and crawled out of the wreckage laughing hysterically. We thought it funny as well because a number of years ago on the Saco River that was us! Today is a relatively short travel day. 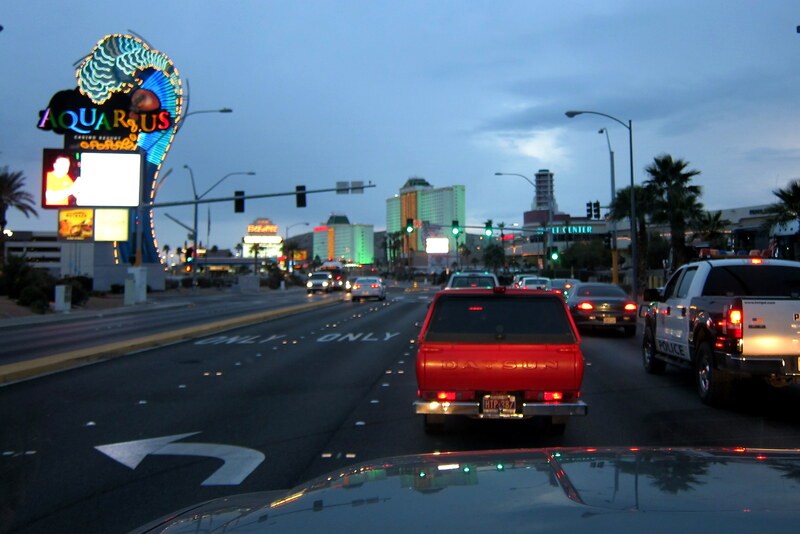 It’s only 432 miles to Las Vegas, a trip we’ve made in the past in one day. However our new normal is travel days less than 300 miles, and since we aren’t scheduled to be in Vegas until tomorrow anyway, we intend to find a convenient spot mid-distance to overnight. As I was making all preparations to get underway a fellow camper noticed our Maine plates and stopped to chat. Russ is from Vancouver Island, British Columbia and when he and his wife Dorothy are not traveling in their 30 foot camper they live on their 50 foot wooden schooner. He was curious about cruising to our side of the continent and spending some time in Maine waters as well as exploring the Canadian Maritimes. I told him what little I knew but assured him we had many friends that could give him some excellent sailing guidance. We exchanged contact information so if and when he makes the transit, we can hook him up. By 1000 we were on our way as the temperatures were climbing into the 60’s. Taking Tangerine Trail over to I-10 we continued west, however over the next few hours I-10 actually meanders more northerly…..which is fortunate as the 30 MPH winds are coming from the south. After taking an additional turn on the sway control adjustment the camper behaved pretty well and with the tailwind we were experiencing, our average MPG shot up to 13.8! 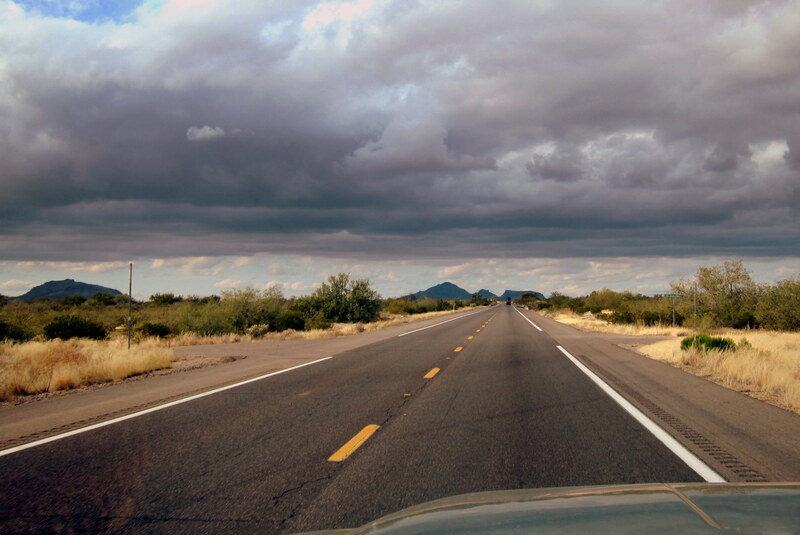 This portion of I-10 is pretty desolate as there are many miles between settlements. A bit north of the I-8 interchange we entered an agricultural area and the consistently high winds picked up a bunch of Arizona and carried it toward Nevada. 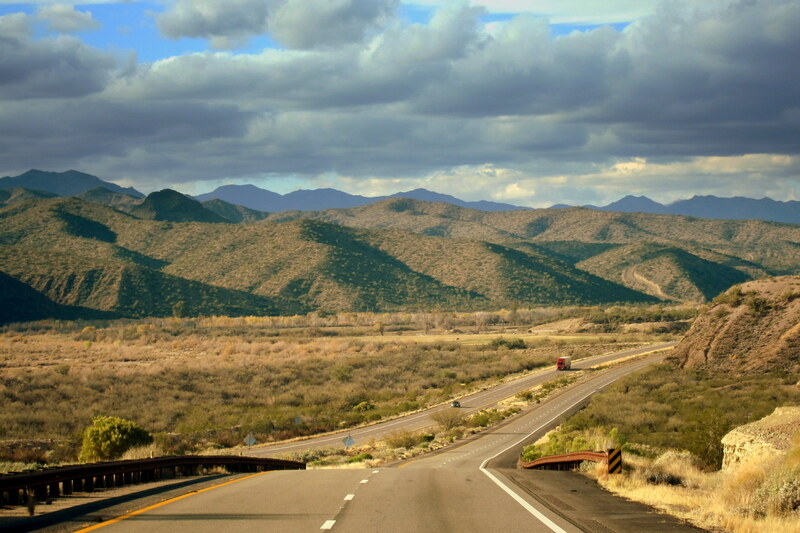 North of Phoenix, we pieced together a couple of US highways and then rode AZ-68 West to the border. The desert landscape began to change as we increased in elevation into the high desert. 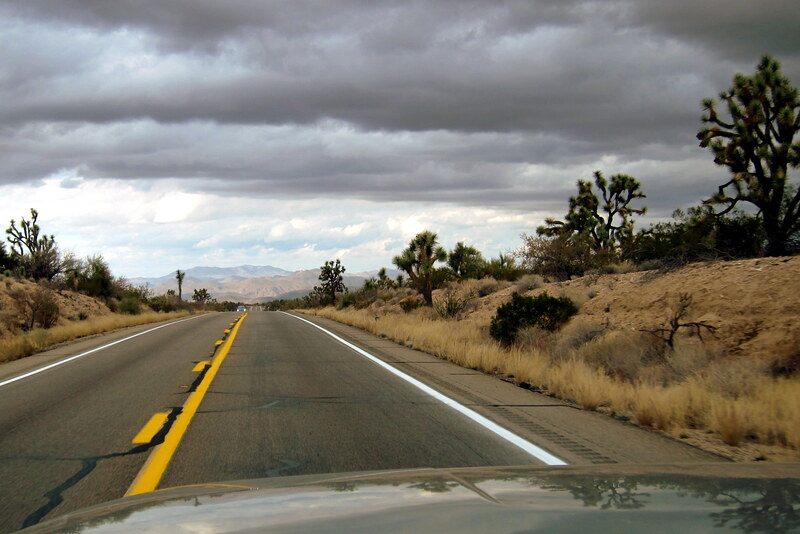 In the mountains, the wind had moderated considerably and we entered into the climate zone that supports the famous Doctor Seuss Joshua Trees. 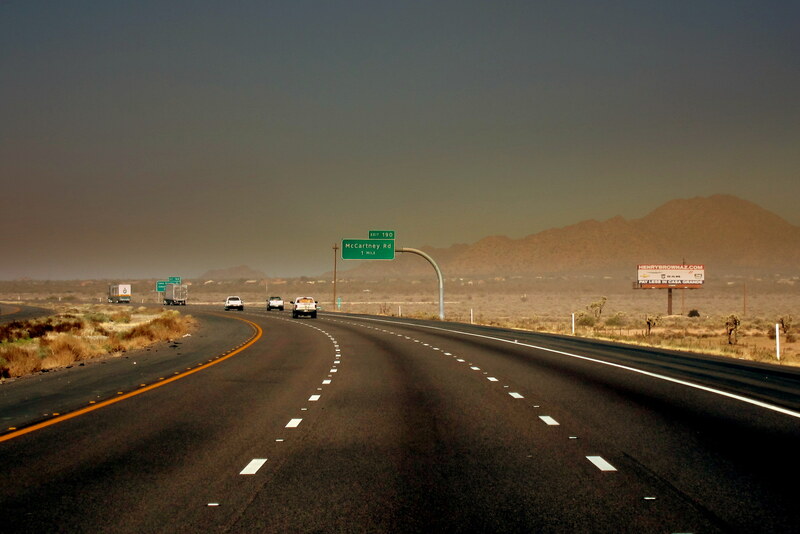 At 1609 we passed through the border town of Bullhead City, Arizona and crossed the Colorado River into the state of Nevada and the Pacific Time Zone. Even though it was only 1510 we decided to seek out a safe, flat spot to remain overnight. On this, the Nevada side of the river gambling is legal and there are a number of casinos…..basically a Baby Vegas! Pulling into the RV Parking lot at the River Palms Resort we were adopted by a pleasant couple from British Columbia that helped us with the process of getting a casino permit to stay the night. Staying in their Arctic Fox truck camper we instantly developed a kinship as they invited us to park near them. We had a great view out our bathroom window overlooking the mini-strip and the meandering Colorado River. 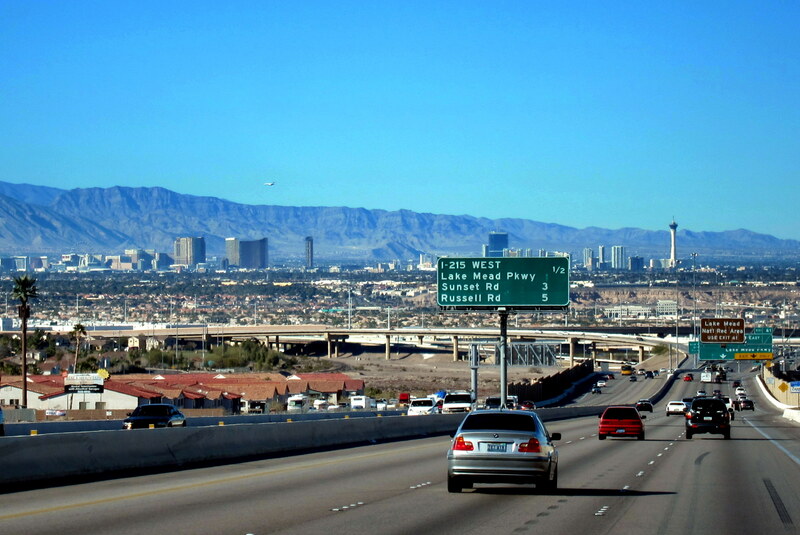 Friday, December 20, 2013: Only 101 miles to Las Vegas! We lounged about the parking lot and took care of some online correspondence and bill paying. I also put the finishing touches on Journal #3 and asked Kit to proofread and add her corner bits. Even though my intention was to publish the journal on Sunday, I knew once in Vegas our quiet time would be limited…..which is exactly what we want! 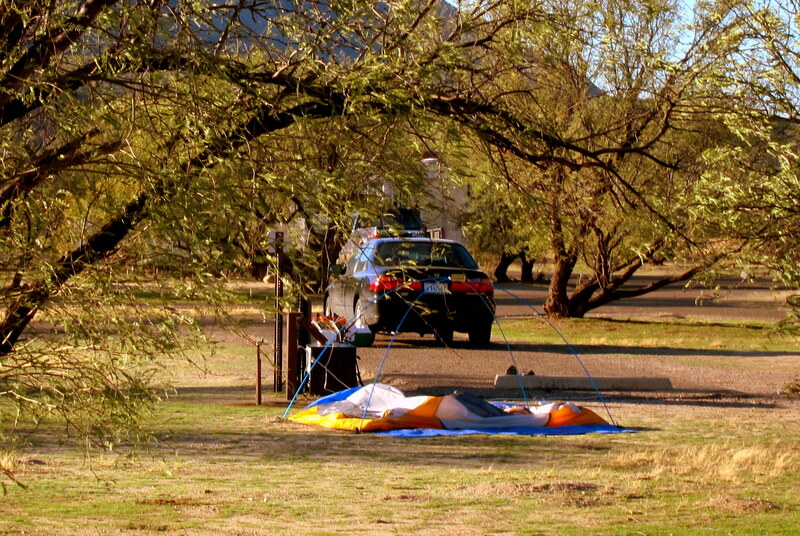 We bid our new camping friends safe travels as they headed on toward their own adventure further south along the Colorado River. 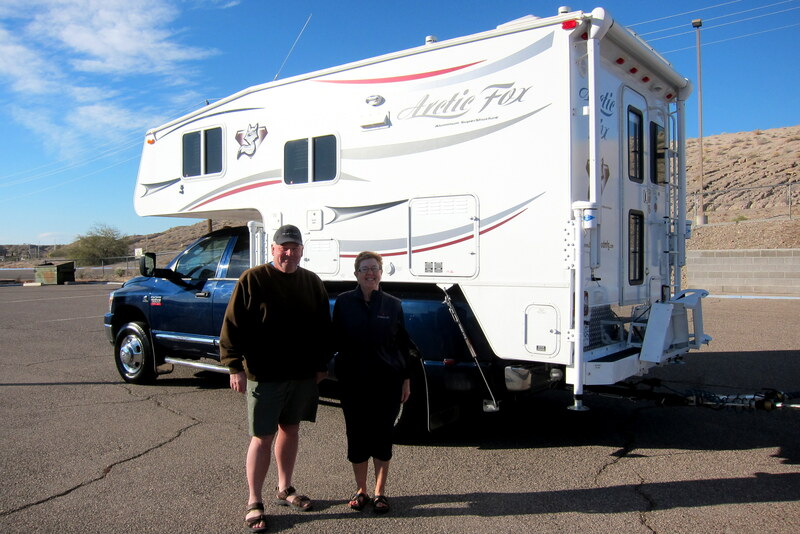 Bob and Ellen are retired business owners and used to travel in a mega-motorhome but found their camping opportunities were severely limited. Since they are avid outdoors folks they prefer to camp in more rural settings so traded in their bus for this rig. They had a pair of high end mountain bikes strapped to the back of their towed vehicle. We compared notes on great trails in the southwest we had each experienced and hope to connect at some point to ride together. By 1036 we were on the road under sunny skies and temperatures once again climbing into the 60’s. The wind has moderated a bit but was still blowing at 15 MPH with gusts near 25. 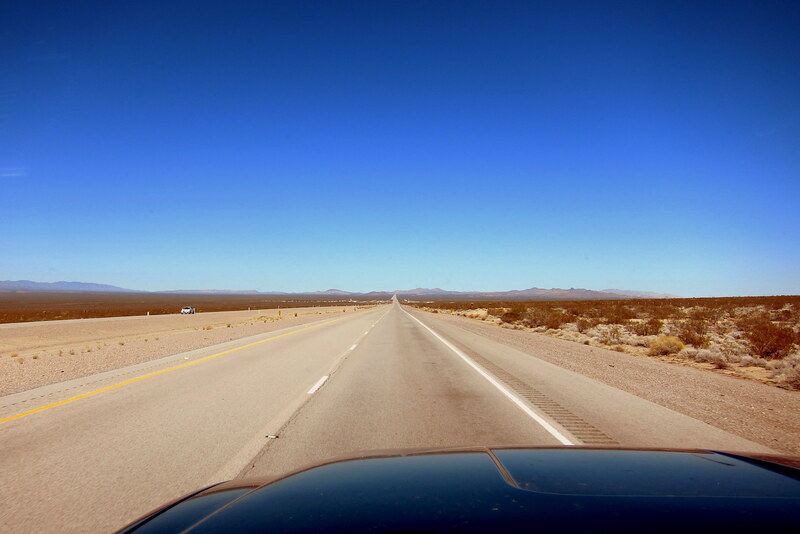 On NV-163 heading north we encountered some typical desert terrain…..a lot like west Texas. Man, one would not want to experience a breakdown here! Two hours later we came over the final ridge into the Las Vegas Valley and got the first glimpse since last March of our home for the next few weeks. 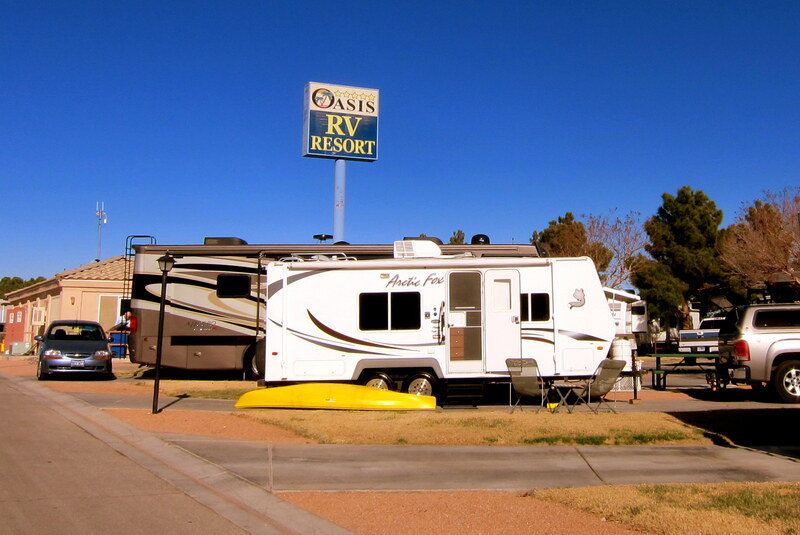 A short time later we found the Oasis RV Resort which is just west of the south end of the strip and a mere two miles from the grandkid’s house. I think their parents live there as well. Dropping the trailer, hooking up all services and leaving the kayak we drove to a pizza shop and headed to their house for a surprise reunion. Stay tuned for Christmas in Vegas…..a first for us with our youngest grandchildren. Kit’s Corner: Now, I have to write some “bits”. I can never think of anything. 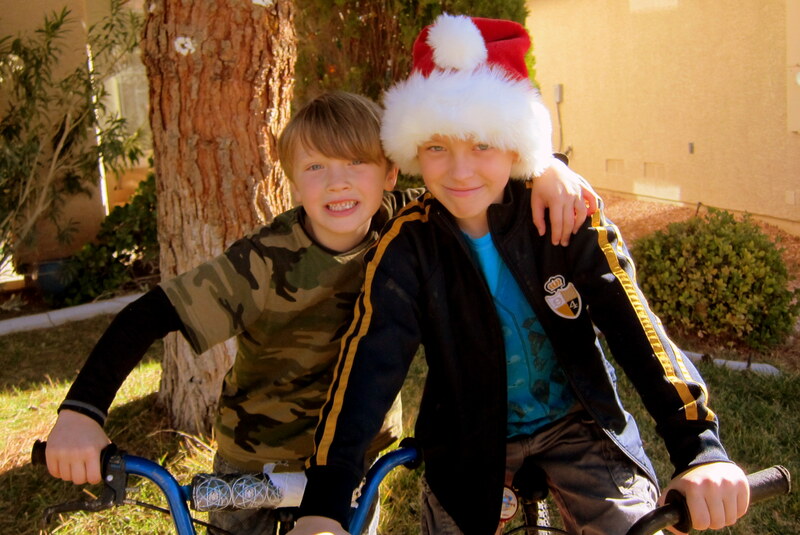 We are happy to have the opportunity to spend Christmas of 2013 with our youngest grand kids, Jack, 9 and Tucker, 6.5. They are always happy beyond words to see us and spend time in our little camper, even though we have to move things around constantly to accommodate the mountains of stuff they bring. They don’t travel lightly. Somehow, we always manage, though. We have the simplest of meals, use paper plates, bowls and cups to reduce dishwashing and also indulge them in fun times, and a few too many sweets. It’s always fun seeing them. Before we know it, they will be teenagers and more interested in their friends than the “old folks”. We are incredibly fortunate to have this time with them. Time to fix mac’n’cheese and hot dogs! Looks like a good time is being had by all in Nevada. Did try to send you an e-card for Christmas as you are on the road. Don’t know if it actually got there. If not Joe and I wished you a Merry Christmas and a Happy New Year! We are having a blast with the kids here in Las Vegas! Do not remember receiving an e-card from you folks but thanks for the thought, hope you all had a great Christmas as well! Enjoy the Grands! Wishing you Happy Trails in 2014. Thanks, we are. Hope your Christmas has as enjoyable as ours. Please wish Winston a Happy Birthday from us…..we Miss you guys! Have a great time with your little family at Las Vegas! Would you give Tucker a special hug from us? What a kid! So much fun with him (and his grandparents as well) last summer! Have a very special time with family as long as you can! Happy New Year! We did and he said hi! Enjoyed hosting you folks in Maine…..return any time! Hope to see you at some point during our meandering about. So glad you have finally been able to spend a Christmas with Jack and Tucker. Grandchildren are soooo much fun! We miss Elise, but had a great time with Sandy and Marie. Keep the journal coming…we love it and your “little bits”, Kit! Kit and I thank you for the nice comment. 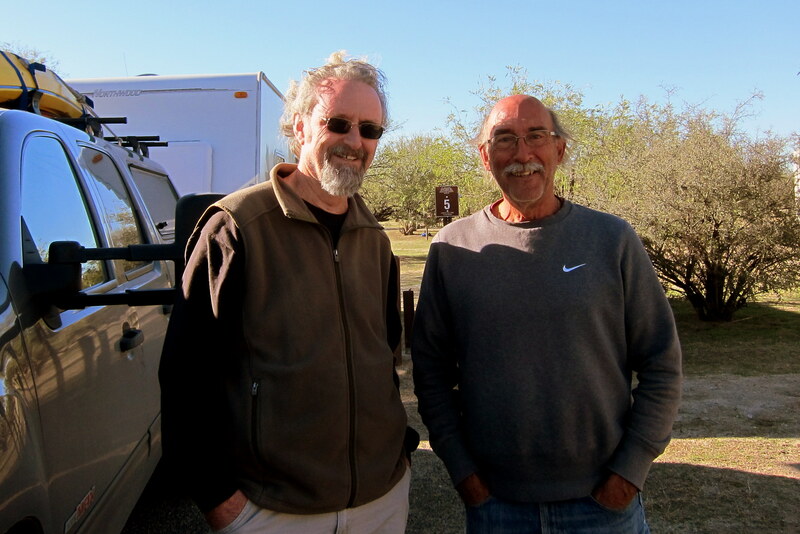 We are having a blast with Jack and Tucker, however they appear to be far more active this year…..or we’re far older! It’s great to read the journals again and catch up with you folks…Jack and Tucker will “tuck you out” just fine and it’ll be over before you know it…we also know you’ll enjoy and cherish every moment of it! We just finished spoiling our little ones and will be heading back South for warmer weather (you couldn’t have picked a better time to leave Maine…) and look forward to hearing more of your Excellent Adventures. Thanks folks, great to hear from you! We continue to enjoy the boys and all their antics…..we are keeping in pretty good shape by keeping up with their very active lives. Glad you enjoyed time with your family this Christmas and that you are heading for warmer climes. Please take care and please stay in touch. PS…..thought of you Bob, as I rebalanced my portfolio for the 10th time of the year a few days ago. What a crazy (good) year in the market!! Kit and Bill – once again, we celebrate along with you on your journey. You really found a sweet spot with your grandchildren. After all, being a grandparent is one of the very best places in life to be. Your beautiful photos and vivid descriptions for us snow bound yankees gives us a vicarious lens to warmer climate sights. Continued smooth travels as you carry with you wishes for happy days throughout 2014. Thanks folks for the nice comment! We are indeed having a blast being on the road this time of the year, seeing new sights, meeting new people and spending quality time with family. Hope you had a great Christmas and will enjoy a very good New Year. Take care and stay safe! ABOUT ZEEERO 12/31/13 AT 6:50 IN BOWDOINHAM AS I TYPE. THIS HAS BEEN THE MONTH FROM HELL AND LOOKS LIKE JANUARY WILL START OFF WITH A SNOW STORM ON WEDNESDAY PLUS BITTER COLD. WE HAVE HAD ABOUT 21 INCHES SO FAR. I’M SURE SPENDING CHRISTMAS WITH THE GRANDKIDS WAS SPECIAL. U AR SO RITE KIT! SOON THEY WILL BE TEEN AGERS AND DRIFT AWAY. THAT WAS A NEAT TRUCK CAMPER SET UP. DODGE RAMS IN THE 1500 CLASS CAN’T SUPPORT A CAMPER, HAS TO BE A 2500 OR HEAVIER. THAT WOULD BE A PRETTY THIRSTY BEAST TO FEED ME THINKS. AT ONE TIME WE THOUGHT OF INVESTING IN THAT MODE OF TRAVEL. HAPPY NEW YEAR AND STAY SAFE. Hi folks, thanks for the newsy comment. Sorry about all the terrible weather you guys have had to deal with…..saw where it was -13 degrees in town this morning. We had a great Christmas with the kids. Plan on hanging in Vegas a few more weeks then head to the coast, after that…..not sure. Take care, stay safe and keep each other warm! Well, Happy New Year right back at you…..great to hear from you folks! We are indeed having a blast with the kids, and trying to keep them active and engaged every day. Not sure who is wearing whom out first!?!? However we all sleep soundly in this little camper. Rough plan is for us to hang out here in Vegas a few more weeks then head to the coast. Then slowly meander down to San Diego for a week’s stay at some point. We will keep in touch as we would really like to see you folks as well!